Arthur Penn Ramirez, a leader in materials science and cutting-edge applied and basic research, has been named dean of the Jack Baskin School of Engineering at the University of California, Santa Cruz. Ramirez, who has held management positions at Bell Labs and Los Alamos National Laboratory, joins the school at the beginning of its second decade. 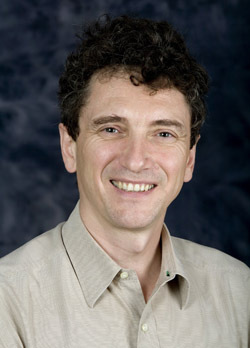 Ramirez is currently leader of composite materials and device development for LGS, a subsidiary of Alcatel-Lucent. He joined AT&T Bell Laboratories in 1984 and spent much of his career at Bell Labs, now a unit of Alcatel-Lucent. In 2000, he went to Los Alamos National Laboratory, where he led the materials integration science laboratory and the condensed matter and thermal physics group, before returning to Bell Labs in 2003. At Bell he served most recently as director of the device physics research department. Ramirez is also an adjunct professor of applied physics and applied mathematics at Columbia University. Established in 1997, the Jack Baskin School of Engineering is UCSC's first professional school and has developed to meet the technology demands of the 21st century. Its growing presence in Silicon Valley includes collaborations with industry partners to create new opportunities in research and education. "With his knowledge, experience, and vision, Art Ramirez will be a great leader for our innovative Baskin School of Engineering," said UCSC Chancellor George Blumenthal. "During its first 11 years, the Baskin School has recruited a dynamic faculty, focusing on 21st-century technologies and partnerships with universities and companies in Silicon Valley. Art's experience and commitment to excellence will help our faculty, students, and staff build on the early successes of our engineering school." Ramirez will take the helm at the Baskin School of Engineering on May 1, 2009. He succeeds Michael Isaacson, Narinder Singh Kapany Professor of Optoelectronics, who has served as acting dean of the school since 2007. Ramirez said he relishes the opportunity to lead an engineering school that emphasizes innovation in an interdisciplinary setting. "Technology is becoming multidisciplinary. Engineers need an expansive mindset," Ramirez said. "When we expose students at every level to technology-driven research, they become comfortable with unsolved problems and gain the confidence to explore them. Faculty define the areas of research and, through teaching, set the standards for excellence. At the Baskin School of Engineering, there exist the very best examples of research and its dissemination." Ramirez's research interests include frustrated systems, multiferroic magnetic materials, and organic semiconductors. He also has led projects that moved successfully from research into the product development phase, such as a micro-electro-mechanical systems (MEMS)-based magnetometer developed at Bell Labs for applications such as low-cost perimeter security and navigation. Ongoing research projects led by Ramirez include the study of fundamental charge transport in crystalline organic semiconductors. Potential applications of this work include the development of efficient, lightweight, and inexpensive photovoltaic cells. In earlier research, Ramirez performed the first bulk measurements of superconductivity in both cuprates and carbon-60 "buckyballs," pioneered effects of geometrical frustration in magnets such as the "spin ice" state, and led research in "colossal magnetoresistance," among other accomplishments. He is the author of more than 200 technical publications. A fellow of the American Physical Society (APS), Ramirez earned B.S. and Ph.D. degrees in physics at Yale University. He has served on numerous advisory panels and committees, including the APS Council, the executive committee of the APS Division of Condensed Matter Physics, and the Solid State Sciences Committee of the U.S. National Academy of Sciences. The Jack Baskin School of Engineering at University of California, Santa Cruz prepares technologists and sponsors technology for our changing world. Founded in 1997, Baskin Engineering trains students in six future-focused areas of engineering: biotechnology/information technology/nanotechnology; bioengineering; information and communication infrastructure; mathematical and statistical modeling; software and services engineering; and system design. Baskin Engineering faculty conduct industry-leading research that is improving the way the world does business, treats the environment, and nurtures humanity.